This small 178 hectare park consists of two parcels on either side of the Fraser River south of the city of Prince George. Public recreation opportunities and trail access is available on the west side of the river. Up until 1914 the Fraser River was the highway in and out of this part of British Columbia and Fort George Canyon was one of the obstacles that sternwheelers had to navigate. Rapid and dangerous, this canyon abounds in whirlpools and massive, jagged rocks close to the surface. The park is day-use only. Natural Features: Historic Canyon on the Fraser River, the park protects the historic winch site used by paddle-wheeled boats in the early 1900s and related portage, a native fishing site and popular hiking trail. Bring your own drinking water as potable water is not available in the park. Drinking out of any streams or lakes is not recommended unless the water has been filtered or treated. A 4.8 km trail provides access to the west side of the river. The trailhead is located off West Lake Road, 24.5 km from Prince George via Highway 16 west and Blackwater Road. The trailhead and first part of the trail remain under Ministry of Forests jurisdiction. From the edge of the plateau down to the river, the trail is in the park. The park is not road or trail accessible from the east side. Directions from Prince George: take Highway 16 west to the Blackwater Road. Turn left onto the Blackwater Road and follow it for 11.3 km and turn left onto the West Lake Road. Follow the West Lake Road for 9.7 km and turn left onto an unnamed road. Follow this road for approximately 3 km to a parking lot. The hiking trail is approximately 4.8 km to Fort George Canyon. As the main portion of the 4.8 trail is under the jurisdiction of Ministry of Forests a trail map can be picked up from them at the Ministry of Forests Office in Prince George. History: The Fraser River is designated as a Canadian Heritage River and Provincial Heritage River. As the largest river in British Columbia, and the most productive salmon fishery in the world, the Fraser River has played a major role in supporting human life along its length. Locally, Fort George Canyon was an important fishing site for First Nations peoples. The river was an important route for early explorers. In more recent years, the river was used as a route for transportation of people and resources. Fort George Canyon was one of the few obstacles along the river in north central British Columbia. In the early 1900’s sternwheelers would have to be winched through this treacherous section of river while passengers would have to portage. Cultural Heritage: This area is a native fishing site. The canyon was a major impediment to sternwheelers, and this natural feature had a significant effect on the development of the region, particularly during railway construction. The area is a special feature in the Nechako Lowland Ecosection. Dramatic canyon feature with pinnacles of volcanic rock and several islands. Riparian vegetation; the east side of the river was previously used for grazing. Wildlife: The park is a salmon migration corridor. The park supports white sturgeon populations and a large variety of other fish species. Bicycles must keep to roadways. Bicycle helmets are mandatory in British Columbia. The trails are not well suited for cycling. Anyone fishing or angling in British Columbia must have an appropriate licence. 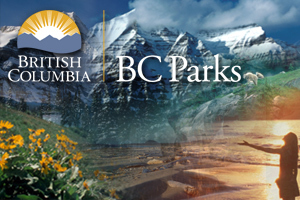 Please read the BC Freshwater Fishing Synopsis for site specific information. A 4.8 km trail provides access to the west side of the river. Along the trail there are interpretive signs outlining key features of the ecosystem in this area. For your own safety and the preservation of the park, obey posted signs and keep to designated trails. Shortcutting trails destroys plant life and soil structure. The park is open to hunting. All hunters to the area should refer to the current BC Hunting and Trapping Regulations Synopsis. There is no viewing platform but from the plateau, you can view the canyon with rapids. You may also have an opportunity to see wildlife in this park. There are cross-country skiing and snowshoeing opportunities along the trails in the park. Keep in the mind the trails are not maintained or trackset. This park has a day-use/picnic area located at the trailhead parking lot. This park only has pit toilets located at the trailhead parking lot. There are no flush toilets.